after signing an enhanced strategic cooperation agreement between Barrick and Shandong Gold. Barrick Gold Corp. announced on July 9 it has entered into an enhanced strategic cooperation agreement with Shandong Gold Group Co. Ltd., deepening its partnership with one of China’s leading mining companies. The agreement builds upon an earlier one signed between the two companies in April 2017, when Shandong Gold Mining Co. Ltd. acquired 50% of Barrick’s Veladero mine in Argentina. Building on the companies’ intent to evaluate joint investment in organic mining projects currently owned by Barrick or Shandong Gold, the companies agreed to consider opportunities to work together on acquisition opportunities or potential asset sales, if both parties agree it is in their best interests. Shandong Gold is currently completing an independent evaluation of the potential to develop a mining project at Lama in Argentina, including a high-level evaluation of potential synergies between Lama and the nearby Veladero operation. After the study is complete, the two companies may agree to conduct additional studies and technical work to evaluate a number of development options, including the construction of an open-pit mine at Lama; the feasibility of using heap-leach processing for low-grade and easy-to-leach gold ore; and the feasibility of adopting low-cyanide or other environmentally friendly leaching reagents. A decision by Shandong Gold to invest in the project would be subject to agreement between all parties. The agreement will also strengthen the collaboration between Barrick and Shandong Gold teams. The companies have agreed to choose one of Shandong Gold’s mines as a platform for learning and collaboration. They will share technical expertise and best practices related to mining technology, information technology, information management and digital innovation. 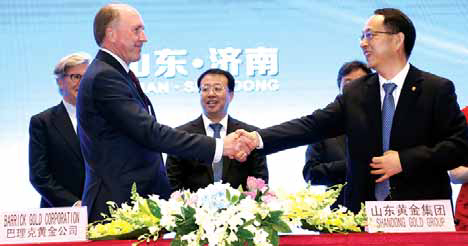 Barrick and Shandong Gold have also agreed to establish additional mechanisms to foster greater communication and knowledge-sharing between their respective management and technical teams. The parties also agree to provide access to their respective supplier networks, service providers, investors and capital providers.